Selected the railroad-esque strip of windows from the dome. Pasting the windows into a seperate document, I began to erase the actual windows and cut-paste the steel dividers to make it look like a rail track. Finished result of step 2. Here shows the railing from step 3, next to the roof of the dome which I cut out. I warped the roof piece into the shape of a hill and used hue/saturation adjustments to turn it a green. Duplicated the hill 4 times; used transform and flip to make them look varied. Also added a grass texture to it. I created two curve layers with masks: one making the hills very bright, and the other, very dark. I filled in both layers with black, then used a large, soft, white brush to reveal portions of the masks. The dark mask is revealed at the shadowy bases of the hills, while the bright mask is revealed near the tops where the light would hit. Selecting the individual hills prior to painting made for a much cleaner edge. The finished result of step 7. A final overall curve layer was added for contrast. Here I simply copied the tracks a few times and pasted them over the hills, warping and erasing some of the edges for them to fit. Here I added the sky pic and gave a slight drop shadow to the rails. Note that the rails are given shading because they are under the curves masks. With the hills finished, I went back to the source pic and extracted a small piece of grey. This will be the texture on which I build the train. Warped the grey sliver into a usable chunk. With much copy, pen tool, hue/saturation adjustments, and pasting, I create several small components which I give different shades of red and assemble them into a train. The headlight effect was created with the Luce filter (see source links). Here is the more-or-less finished skeleton of the train. Cut out the front part of the building. Using the same piece as for the cow catcher, I make a circular ornament which will serve as the wheels. Stuck the wheels to the train. The bolts on the wheels are made from scratch; the metal strips are warped copies from from the railroad. Began to shade in the train with dodge and burn. Here's the finished result of the shading. The bolts on the train are the same ones used on the wheels. 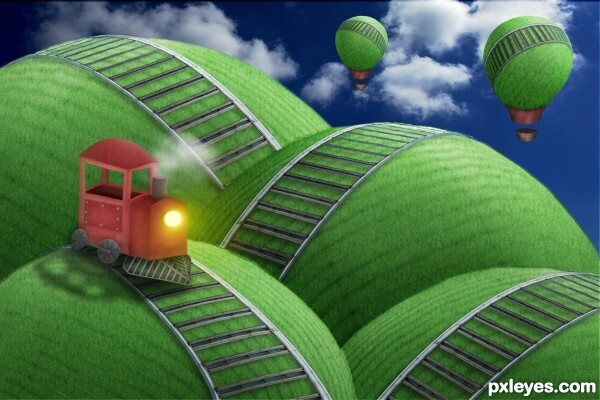 Here I used an array of texture brushes (on clipping masks) to texturize each section of the train. Texture brushes are mentioned in the source URLs. The smoke from the smoke stack is from a cloud brush set which is also mentioned. Here I made a black-filled copy of the train and distorted it into a rough shadow. Used guassian blur on the shadow, changed opacity, and made a seperate layer ontop where I drew under the train with a slightly darker brush to make a convincing shadow. Some final warp and transform adjustments on the train to make it better fit the tracks. I also raised the train roof a bit to give it a slight bevel. With the train finished, work begins on the hot air balloons. I copied one of the hills, along with its track, and pasted a smaller copy of it up in the sky. Did some extensive warping on the hill to give it the rough shape of a balloon (I fixed it with the eraser and further warped it as I went along). Also copied the track and warped it as well, flipping it onto the other side of the balloon. Here I did some more warping, cutting, and eraser work on the mirrored tracks to make them appear as if they're encircling the balloon. Here I used the same shading and shadow process as I did earlier on the hills to give the balloon a 3D feel. Drop shadow on the rails. Now I copied another small piece of the hill and warped it into a bottom piece for the balloon (I removed the former grass texture on this piece). Gave it new texture, dodge, and burn as I did with the train parts, and colored it a light red with hue/saturation. Here I added a few strings with the line tool (with a bit of inner glow) and copied the balloon bottom at the end of the strings. I then created a large square on a seperate layer and added to it a cross-stitch texture. Made a clipping mask with the texture square over the basket and warped it to fit. Also colored the basket brown with hue/saturation. A bit of final shading to the basket. Also copied the basket piece without the texture and warped it as the back of the basket on a seperate layer behind. All that was left was to duplicate the balloon and paste it somewhere in the distance. I then rotated the railing on the balloon copy for a bit of variation. And it's done!